Business valuation firms use a variety of techniques to value companies including the Discounted Cash Flow Model, Public Market Comparisons and various Asset Value methods. While these valuation methods are technically accurate and provide the owner with valuable information for the purpose of tax planning, estate planning and divorce settlements, they do not necessarily reflect the true market value of the company when it is offered for sale. WHY SHOULD YOU CARE HOW BUYERS VALUE BUSINESSES? By understanding the fundamentals behind business valuation, you have the ability to focus on and improve the specific financial metrics that buyers equate with value, and by doing so you will be able to increase the purchase price of your company when it is sold. Also, you will be able to better prepare for and plan your exit strategy since you will know what financial goals your company must reach in order to obtain the price that you require. This article briefly discusses the process that the majority of buyers use to determine company value. Buyers generally form the basis for the price they offer by calculating and analyzing a financial measurement called EBITDA (Earnings Before Interest, Taxes Depreciation & Amortization). To calculate EBITDA, start with the pre‐tax profit of the business and add back interest expense, depreciation and amortization. The company’s EBITDA is then adjusted for unusual one‐time expenses or items that will not continue under new ownership, such as non‐business related travel, auto expenses, excess salaries (hey, we know you are worth it), excess rent, etc. For a simplified example see Exhibit 1. 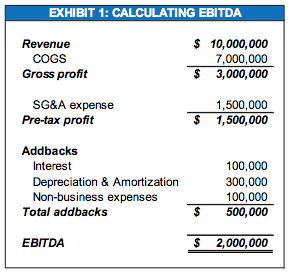 After the company’s EBITDA is calculated, it is multiplied by a number (the “Multiple”) to arrive at a value. The multiple applied to a particular business will vary based on several factors, but for profitable mid‐sized companies multiples generally range from 3x to 7x EBITDA. High margin, niche businesses with a strong track record of growth and profitability will command high multiples, while low value‐ added, commodity businesses will tend to garner lower multiples. Generally, larger companies receive higher multiples than smaller companies and companies that operate in capital intensive industries tend to sell for lower multiples due to the ongoing capital expenditures required to maintain the business. IS EBITDA THE BEST METHOD? EBITDA is used to analyze a company’s operating profitability by excluding the non‐operating expenses (interest and taxes) and non‐cash charges (depreciation and amortization). It is a good way to compare the performance of companies within an industry to identify companies whose operations are more efficient. Also, since most acquisitions involve some type of financing, a company’s EBITDA gives the buyer an indication of the company’s ability to service the interest and debt payments used to acquire it. Although EBITDA is often referred to as cash flow, it does not take into consideration the cash required for working capital, continued capital expenditures or debt payments. Therefore, some controversy in the financial community exists as to the usefulness of EBITDA as a measurement tool of a company’s performance. Regardless of the debate, the EBITDA Multiple Method is the most commonly used method by buyers to value acquisitions; therefore, it is important to know what it is and how to calculate it. WHICH MULTIPLE WILL THEY USE? Perhaps the most important and most overlooked way to increase the value of a company is to hire or train competent management to replace yourself if you plan to leave following the sale. Buyers are less likely to pay a premium multiple for a company whose success is completely tied to the owner. They will pay a premium, however, for a company with a management organization and infrastructure in place that will continue after the company is purchased. If the existence of your company is dependent on you showing up to work every day, you should consider bringing in new talent or promoting your top management in order to minimize your importance to the organization. It is important for sellers to realize that buyers of mid‐sized companies are sophisticated business people. They will go through a rigorous evaluation of a potential acquisition candidate before making an offer to purchase it. If the seller’s expectations are far outside the range of reasonable multiples paid in the industry, buyers will pursue another avenue to enter the market, such as acquiring a competing company. The objective is to convince the buyer that your company deserves the top multiple paid in the industry. To achieve this, you must clearly communicate the value of your company to potential buyers and show why the acquisition makes financial sense for them. 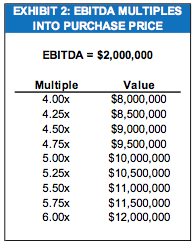 As shown in Exhibit 2, by increasing the multiple paid from 4.5 to 5.0 times EBITDA a seller receives a $1 million purchase price increase. Having a trusted and experienced advisor on your side to analyze your company, prepare the offering materials, negotiate with buyers, and close the transaction is the best way to ensure that your company receives the highest possible EBITDA multiple. Ultimately, a business is worth what the “market” will pay at any time. In the “market” for small‐ to mid‐sized businesses the question ‐ what is my business worth? ‐ is most commonly determined by the EBITDA Multiple Method. Understanding how the “market” will value your business levels the playing field with prospective suitors. Gryphon Growth Group understands the selling process from the perspective of both the buyer and seller. Because buyers and sellers begin negotiations from opposite ends of the spectrum, Gryphon is called upon by business owners to help them articulate the solid opportunities and advantages of their company in a way buyers can appreciate. In this way, we can substantiate the value of a business for a purchaser and maximize the value you receive as seller.